Burglars are wary of them. Most will avoid your home if they spot a security camera, making them a formidable deterrent. They're also incredibly useful, allowing you to check in on your family or pets via your smartphone, or see and talk to a visitor at your front door. True security cameras—like those powered by Alarm.com—are fully connected to a smart home security system. This gives them features and intelligence that standalone connected cameras don't have. If you're thinking about a smart video camera as a first step into home security, or wondering about bolstering your existing security system with video monitoring, it's worth talking to an Alarm.com service provider first. Get a clear view. Our wireless indoor and outdoor cameras let you see what's happening in HD resolution, with our newest cameras offering 1080p. Take a closer look. Wondering what exactly your kids are watching on TV when you're out? Just open your living room video feed, then use your fingertips to zoom in for a better view of what's happening. See in the dark. 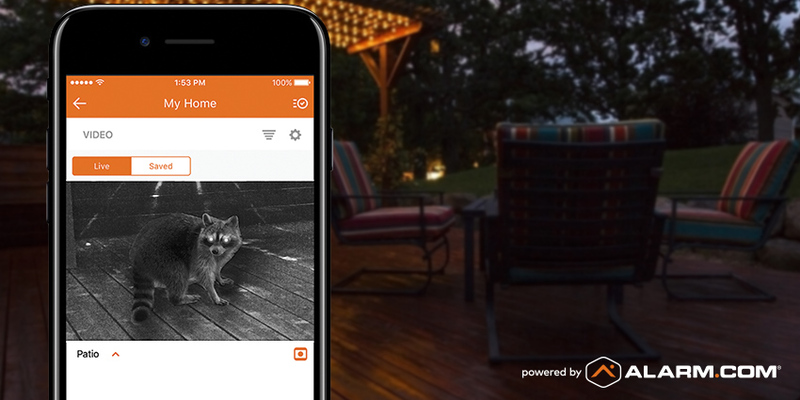 When something goes bump in the night, you don't need to activate your smart lights right away. Our cameras' infra-red night vision makes it easy to see what's going on. Motion on your porch. 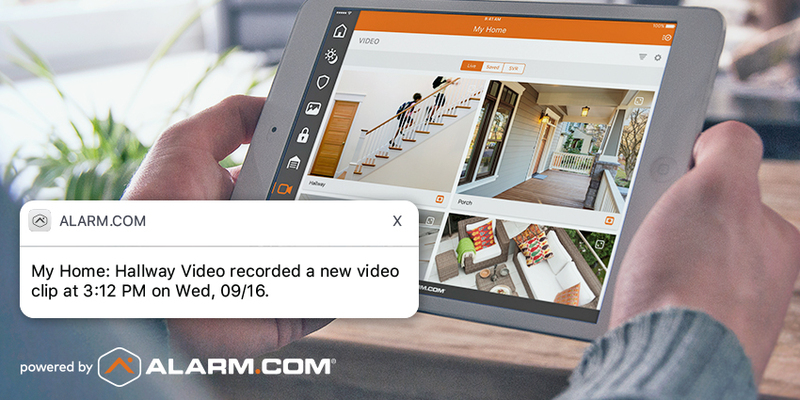 All Alarm.com-powered cameras have motion sensors—but you don't need an alert every time someone moves in your house. It's easy to customize a motion-triggered alert for any single camera—and you can filter it further by time of day, or security arming status. Your kids are home. Alarm.com understands a lot of context behind your home's activity—such as who just unlocked the door. Your kids' unique user codes can trigger a once-a-day video alert to show you they're home safely from school. There's an alarm. In an alarm event, your home's cameras begin recording automatically, ensuring that you won't miss vital footage. Here's a real-life example of why that's so important. Help catch a crook. Burglars and other dishonest visitors return to the same neighborhood over and over. A video clip captured on your front porch could be the breakthrough your local police need to identify and catch them. Brighten someone's day. It's not all about crime! A clip of your toddler playing in the back yard is a great antidote for your partner's bad day at the office, or to keep friends up to speed on your family via Facebook. Installation. If your cameras are part of a full professional install by an Alarm.com service provider, there's no need to worry about wiring, power cables or drilling. To minimize the likelihood of an intruder disabling a camera, your service provider can find and recommend the best installation spots in your home. Configuration. 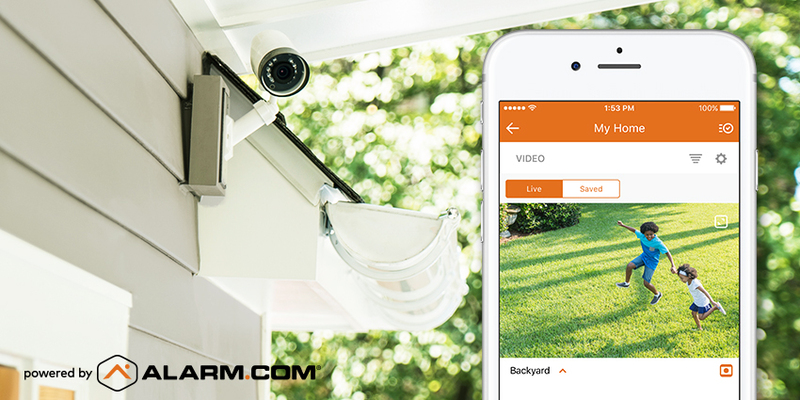 Whether you go pro or DIY on installation, Alarm.com-powered cameras will arrive professionally configured to your security system, sparing you the tricky task of wirelessly configuring and networking your equipment. If you have problems later down the line, your service provider will be on hand to fix them for you. Related: Why Don't People Want to Go It Alone on a Smart Home? Monitored security. Get your security cameras as part of an Alarm.com-powered security system and enjoy professional monitoring as part of the package. In a break-in, fire or carbon monoxide leak, your home alerts a 24-7 monitoring station, where a trained security professional can dispatch help. 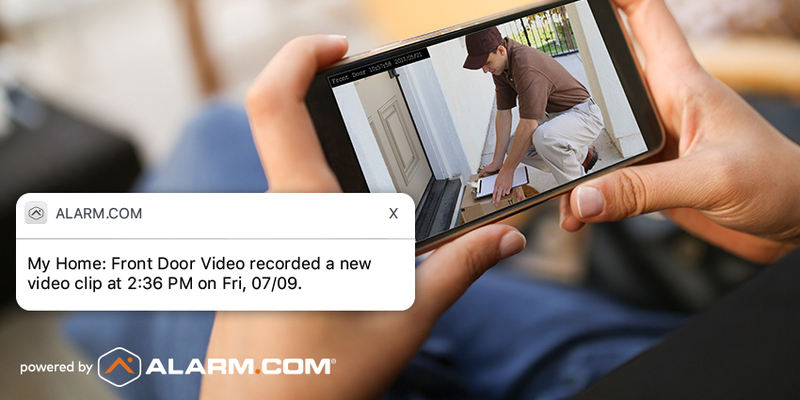 Your Alarm.com service provider has access to a range of award-winning equipment that includes security-grade connected video cameras for every area of your home. Unlike many connected cameras out there, our new 522 camera is beautifully designed to blend in with your home. It comes with onboard night vision and 1080p resolution to capture important activity, clearly, day and night. Our wireless 722 camera is weather-resistant, freeze-resistant and UV protected, with a wide field of view and night vision up to a distance of 40 feet in total darkness. Front door. Our wi-fi doorbell camera is a specialized camera that brings smart home security to your front door. Equipped with a motion detector, microphone and speaker, it allows you to answer your front door remotely, have a two-way conversation with visitors, and capture motion-triggered clips of activity on your porch. As a defense against package thieves, it's second to none. Connected security cameras are an investment that you shouldn't need to make again and again. Buy standalone connected cameras, however, and you may find yourself replacing them every few years for a model with better features. With Alarm.com-powered cameras, you won't have this issue. We regularly update our video monitoring solutions through the cloud, with upgrades and new features delivered digitally, free of charge. This gives your equipment a longer life, and better value. Want to get started with smarter video monitoring? 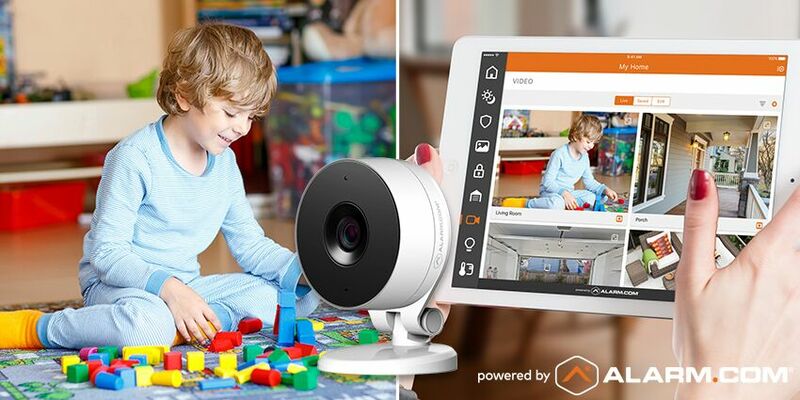 Alarm.com-powered video cameras are sold exclusively by Alarm.com service providers as part of a smart home security system. To find out how to get Alarm.com, click here. Ready to connect with a service provider? Enter your ZIP code in the box below.